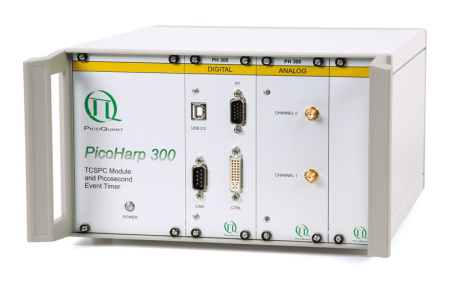 The PicoHarp 300 is a high-end, easy to use, plug and play Time-Correlated Single Photon Counting (TCSPC) system. It is connected to a PC through a USB 2.0 interface. The PicoHarp 300 is a high-end, easy to use, plug and play Time-Correlated Single Photon Counting (TCSPC) system. It is connected to a PC through a USB 2.0 interface. The high quality and reliability of the PicoHarp 300 is expressed by a unique 5-year limited warranty. A special design approach provides identical and synchronized but independent input channels. They can be used as detector inputs forcoincidence correlation experiments or as a pair of start and stop inputs for TCSPC. It allows a forward start-stop operation even at full repetition rate of mode locked lasers with stable repetition rate up to 84 MHz. Experiments with low repetition rate benefit from the PicoHarp’s multi-stop capability. The design allows high measurement rates up to 10 million counts/sec and provides a highly stable, crystal calibrated time resolution of 4 ps. The instrument’s timing resolution is well matched to even the fastest detectors currently available: the SPAD detectors of the PDM series or micro-channel plate Photomultiplier Tubes (MCP). Both input channels are equipped with Constant Fraction Discriminators (CFD), sensitive on the falling edge. The sync channel of the PicoHarp 300 even has an internal adjustable delay with ±100 ns range at 4 ps resolution. This unique feature eliminates the need for specially adapted cable lengths or cable delays for different experimental set-ups. A Time-tagged mode for recording of individual photon events with their arrival time on both channels is available as an option, allowing the most sophisticated offline analysis of the photon dynamics. TTTR data can be correlated in real-time for monitoring of FCS experiments at count rates up to 500.000 counts/sec. External marker signals can be used to synchronize the device with other hardware such as scanners, e.g., for Fluorescence Lifetime Imaging (FLIM). In TTTR mode, the PicoHarp 300 can also be used as a generic event timer, e.g., for Satellite Laser Ranging (SLR). As accessories external routers such as the PHR 800 for connection of up to four detectors are available. Each router channel includes an internal adjustable delay with ±8 ns range at 4 ps resolution to tune for relative delays. External hardware such as monochromators can be controlled via CAN or serial bus (currently supported: Sciencetech 9030, Sciencetech 9055, Acton Research SP-2155 and Acton Research SP-275). The PicoHarp 300 software for Windows provides functions such as the setting of measurement parameters, display of results, loading and saving of measurement parameters and measurement curves. Important measurement characteristics such as count rate, count maximum, position and peak width are displayed continuously. A comprehensive online help function shortens the users’ learning curve. A library for custom programming, e.g., with LabVIEW is also available as an option. Software upgrades for extended functionality will be available with further product development. Measurement data from the PicoHarp 300 can be analyzed by different software packages. For multi-exponential reconvolution the FluoFit software is an ideal tool. For the analysis of TTTR data (e.g., FLIM, FCS, FLCS, FRET, BIFL, etc.) the SymPhoTime 64 software suite is the tool of choice.